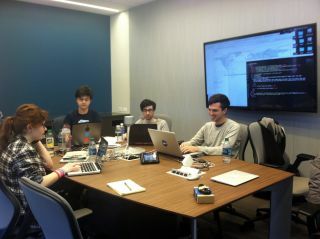 Boot camp participant Katie Orenstein and her team work on a simulation of space junk collisions. NEW YORK — There was a whole lot of hacking going this month at the 2015 International Space Apps Challenge — a three-day NASA event that invites participants from all over the globe to use technology and data to solve problems in new ways. About 200 people showed up at Microsoft's New York City headquarters here on April 11 to participate in the local Space Apps Challenge event. Participants are given access to data from NASA and other space agencies, and are tasked with finding innovative solutions to problems like how to create visualizations of asteroids that may be a threat to Earth, how to improve mapping of safe drinking water sources, and how to design a drone that could fly in alien environments. They're only one of many teams spread throughout three floors of Microsoft's office. Some have taken over conference rooms and auditoriums while others huddle on couches and benches in the open space of the company's dining room. Each team can tackle one of 35 challenges from NASA in the categories of humans, robotics, outer space and Earth — or they can take on a project of their own choosing. They'll work furiously over the next 48 hours to develop a new mobile application, a piece of software or hardware, a data visualization tool, a platform, or some other product that helps solve the challenge they select. A total of 12,780 people participated in the competition both remotely (connecting to the event over the Internet) and from hackathon locations in 133 cities on six continents, including the one at Microsoft's headquarters in New York, according to the event website. This year the Space Apps Challenge organizers gave themselves a challenge as well: To use the event to get more women interested in data, and to foster that interest beyond just one weekend. The idea to focus on women in data at this year's Space Apps challenge came from NASA Open Innovation Manager Beth Beck. At a Space Apps Challenge hacking event in Toronto last year, Beck made a surprising observation: The student groups consisted mostly of young girls, excitedly bouncing ideas off each other. But when she went to the adult competition rooms, the ratio of men to women changed drastically — there were hardly any women participating. Beck wondered, "What happens between when they're young girls excited to join a hacking competition and the time they grow up?" She took that thought to Chief Technology Officer Deborah Diaz at NASA, and together they developed a Women in Data Boot Camp workshop to kick off this year's Space Apps hackathon. "We want to change the ratio," Beck said at a press conference. "To have more women engage with data and have this be a safe data space to engage." NASA astronaut Cady Coleman and IBM Vice President Sandy Carter led the workshop, along with more women from NASA, IBM and various women's coding organizations, such as Girls Who Code and Black Girls CODE. Beck said the room was mostly filled with girls under 21 years old, though a few boys showed up as well. Christian Hoogerheyde, a data solutions architect at Socrata, a cloud software company headquartered in Seattle, was working at the boot camp and saw a young girl looking confused as the group learned about application program interfaces (API). He sat with her and helped her play with the program. Soon she learned to code a simple API call that pulls data onto the screen. "When she saw that window pop up she smiled and she said, 'I can do this,'" Hoogerheyde said at a press conference. And those "aha" moments weren't rare. At the end of boot camp, Coleman and other organizers asked participants to share what they learned. One girl said, "I'm completely changed from this morning to now. We are the future in this room, and we can do some really great things with data." Beck hopes the boot camp grows to include workshops at other Space Apps events next year, instead of a single workshop at the New York event. Orenstein ponders how to calculate the strength of impact when two dead satellites collide. Katie Orenstein, a high school student who Carter said in a blog post is "a great combo between theatre and code," sat among the girls in the front row. Waiting for speeches to begin, she talked with a few boys around her. They decided to work together on their challenge project, and Team Kessler was born. Soon after the ceremony finished, Orenstein and her teammates — who Beck jokingly nicknamed Katie and Da Boyz — got to work on a project simulating space junk collisions based on data that describes both the position and velocity of a satellite. The data came from spacetrack.org, a website that tracks manmade satellites. "These collisions are basically international incidents," Orenstein said while the team worked on their project, referring to the fact that multiple countries have launched satellites that are now uselessly floating in space. Team Kessler's goal was to show what space would look like in 50 to 100 years, after decades of collisions created even more debris. The team also toyed with the idea of creating a space junk game and designing a mechanism to "gather this space junk and bring it back down to Earth for repurposing or refining into raw material," according to teammate Nikola Viazmenski. But, like most hackathon participants, what they worried about first was making it work. "We can always make it bad, and then make it better," teammate Adil Soubki said. By the end of the Space Apps NYC event, at about 6 p.m. on Sunday, April 12, Team Kessler hadn't won a local award for the members' project. But that didn't take away from how proud they were to create something in such a short time. A couple hours after Space Apps ended, Soubki tweeted, "Had a ton of fun @SpaceAppsNYC. @Astro_Cady was absolutely right my team taught me so much."